Parents "need to prioritise eye tests"
Parents down under think that getting their child"s hair cut is more important than taking them for an eye test in the lead up to a new school term, according to a new study. 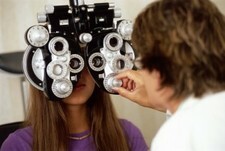 Research by eyecare provider OPSM found that one in five parents had never taken their children to have their eyes checked out, despite eye disorders ranking alongside asthma and allergies as the most common long-term health problems experienced by young people, reports news.com.au. When questioned about their kids" back-to-school routines, just three per cent said an eye test would be at the top of their to-do list, compared to seven per cent who would prioritise a haircut. "We want parents to be aware of the risks associated with neglecting to take their children for an eye examination, not just because it affects health but also academic progress as eye problems and learning problems are often related," OPSM spokesperson Grant Fisher said in a statement. According to the RNIB, thousands of people needlessly lose their sight due to treatable conditions which could be picked up at eye tests.